Phone the Vue Customer services number on 0345 308 4620 to make a new booking, for help in using a promotional code or to report an item of lost property. In 2016 Vue Cinemas recorded just over 20% of the market share of cinema revenue, making it the third largest chain in the UK. This is impressive considering the company only began in 2003 when their predecessor ABC International Cinemas purchased 36 theatres from Warner Brothers. Despite the trend which has seen cinema attendances decline in Britain the company has grown. In 2013 Vue was bought by it current owners Alberta Investment and Management Company and OMERS for £935 Million. Vue Cinemas is a network of cinemas across the UK and Ireland. In Britain there are 85 Vue cinemas including a popular 12 screen cinema at Westfield in London’s Shepherd’s Bush. All the screens are in Sony 4K picture quality and are fitted with Dolby Digital 6.1 surround sound. In March 2018 tragedy struck at a Vue Cinema screening at the Star City complex in Birmingham when a man got his head stuck under an electric seat and died. This incident was reported in the Birmingham Mail. The Vue Customer Services number for all 85 cinemas in the UK is 0345 308 4620. In the Republic of Ireland you can speak to a member of the Vue Customer service team by phoning 1890 800 705. Vue Cinemas across the country open their doors at between 9 am and 10 am every day of the year except Christmas Day. They then open throughout the day and into the early hours of the morning, with many cinemas having night screenings. If you would like to find out the opening hours of your local cinema or would like to check what time a specific film is showing then phone the Vue Customer Services number: 0345 308 4620. Phone the Vue Customer services number on 0345 308 4620, a local rate number you can expect to be charged about the same as if you were phoning a landline number. If you are. not sure you can check with your mobile phone provider. The number can be used to make a booking for a future screening. You can also use the number to report lost property. As well as a customer services number it can also be used to make a complaint about a poor customer service experience at your local cinema. Be aware that when you phone this customer service number you will be greeted by a raft of automated options. If you are calling regarding a complicated enquiry or are trying to track down a piece of lost property the best way to navigate these options is to ignore them and bide your time – eventually you will be transferred to a human customer service operative. The Vue Customer service team can help you to use a promotional code. They can also inform you what’s on at your local cinema and will make a booking for you if you wish. You can also contact Vue Customer services online via email at customerservices@vuemail.com, or on Twitter @VueHelp. There are three ways to report an item of lost property at a Vue cinema: on their website, by telephone, or via email. There is a page on the Vue website where you can report items of lost property: Vue Lost Property. On this page you can leave details of the item you have lost, your contact details and the time and date you lost it. A member of the Vue Customer services team will then contact you to discuss. Alternatively you can phone Vue Cinemas on 0345 308 4620 to report your lost item. Or you can do so by email at customerservices@vuemail.com. Phone the Vue Cinemas events line on 028 396 0202 to organise your corporate meeting at a Vue Cinema. 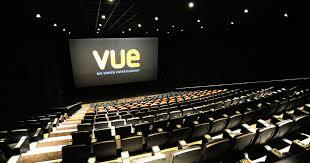 Most Vue cinema venues in the UK have options to book seats for corporate events. Some will also be able to lay on refreshments to add to the party feel. Phone Emma Heaton on 028 396 0202 to discuss these corporate options. Vue Cinemas in the UK also have private rooms that you can book for a corporate event. There is also the option of booking a screen for a private showing if you have enough people in attendance. Phone the Vue Cinema events line on 020 8396 0245. Or if you would like to make a booking then phone the Vue Cinemas sales line on 0345 200 2231. You can also find information on Vue events by emailing events@vuemail.com or visiting the events page on their website: Vue Events. Visit www.vuemoviemoney.co.uk if you would like to book tickets in bulk for 50+ people. Options include VIP seating available in certain screens at Vue Cinemas across the country. Most cinemas companies in the UK advertise the start times of their films about 20 to 30 minutes before the movies actually start, this is to allow time for trailers and advertisements. If you would like to advertise your company on the silver screen then phone Vue Cinemas on 020 7534 6363 to discuss sponsorship options. Ster Century a Slovak movie company that have assets in the UK and Republic of Ireland. You can phone Ster Century’s UK offices in Norwich on 01603 221920. Multikino This cinema chain, part of Vue International, operate in Poland. Their customer services telephone number is: +48 91 831 24 10. SBC Cinema The Taiwan division of Vue International show a respectable number of Western movies and also some movies from Taiwan and China. In total Vue have 212 cinemas in 12 countries worldwide. If you would like to speak to a member of the Vue International team about an investment opportunity then phone their UK Head office on: +44 (0) 208 396 0100.